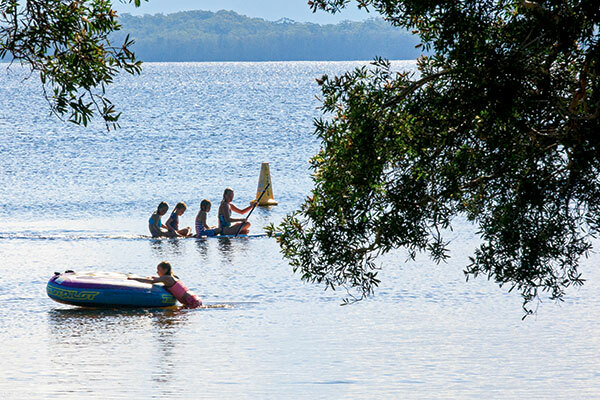 Whether you prefer to camp beside a peaceful lake lined with paperbark trees, next to a wicked surf break or in a subtropical rainforest, the Great Lakes has you covered. Located on the mid-north coast of New South Wales, just a stone’s throw from the Pacific Highway, the Great Lakes is an accessible destination in its own right, or an easy hiatus from the migrating masses on your way up or down the coast. As the name implies, this area is dotted with stunning coastal lakes whose clear, calm waters are a safe haven for tinnies, kayaks and stand-up paddleboards. They brim with flathead, whiting and even dolphins, while flaky paperbark trees shade their grassy edges; a wonderland for goannas, wallabies and water birds. But let’s say all that dreamy serenity isn’t for you. 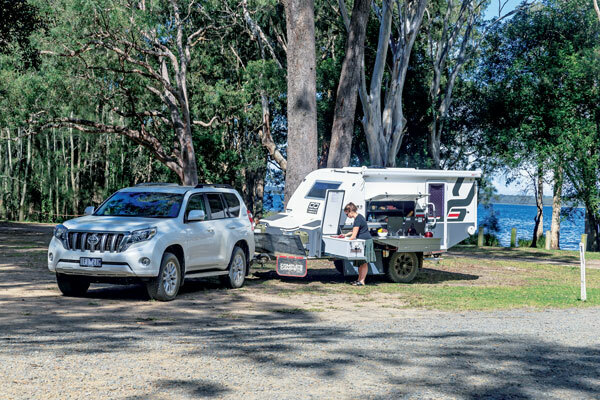 Maybe you’d prefer a bit more action, like dropping your tyre pressures and hitting the beach to find a secluded campsite next to an awesome surf break. The Great Lakes has your back there, too, with a number of 4WD-friendly beaches fringing pristine national parks. Home to the stunning Seal Rocks, this is an idyllic stretch of coast that has been attracting surfers and free-spirited adventurers for years. Or maybe you’d rather disappear into a thick tangle of subtropical rainforest, where the gum trees stretch to the sky as they are want to do in northern NSW, towering over the lush palms and ferns below, their trunks as smooth and straight as a ship’s mast. Here, you can climb mountainous peaks on rocky dirt roads to find bird’s eye views over all of it; Wallis Lake cuddled against the Pacific leaving just a thin isthmus between them, Smith and Myall lakes sitting pretty to the south. 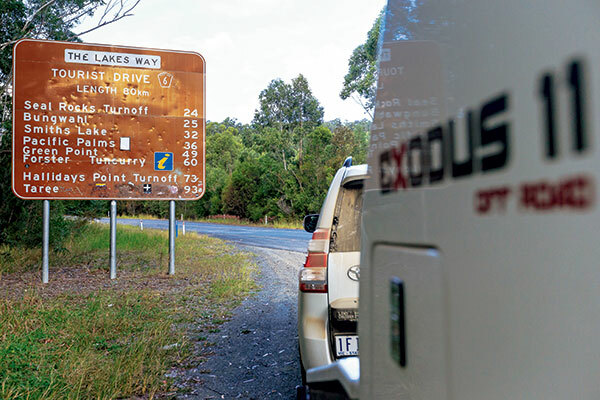 With a Complete Campsite Exodus 11 hybrid camper behind our brand new Prado Kakadu, we were well equipped to explore every last campsite between Forster and Bulahdelah along the Lakes Way, and even further south towards Hawkes Nest. Here’s the best of what we found, from north to south. 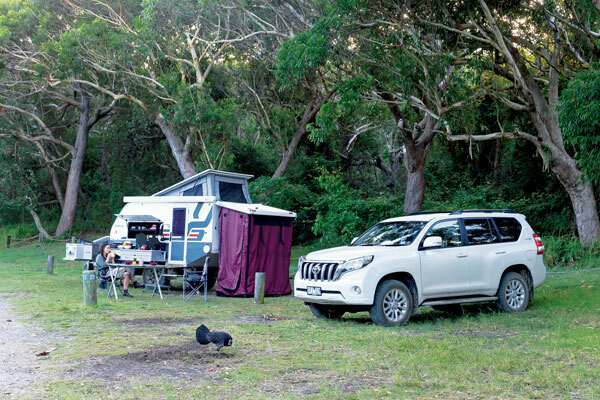 A sprawling, grassy campsite on the thin strip of land between Wallis Lake – the behemoth on which the town on Forster also sits further north – and the ocean, with direct access to the latter via a number of short beach paths. 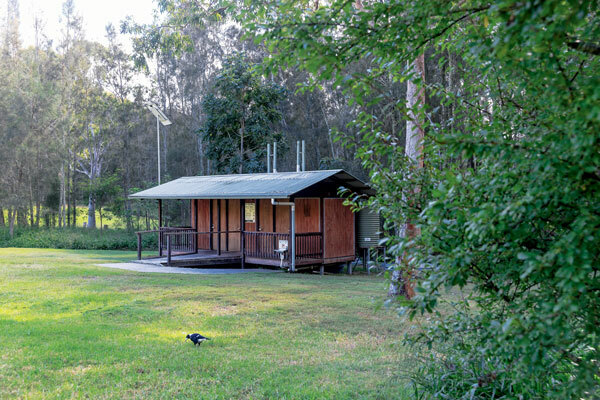 Coming directly off The Lakes Way, the main coastal artery between Forster and Bulahdelah, and the location for the region’s national park’s office, this campsite does get busy and is certainly not off the beaten track. The plus side is a killer location and great facilities, plus it’s close to the services of Forster. A peaceful, shady camping area right on the Wallingat River, you’ll want to pack the fishing rods and kayaks for this one. 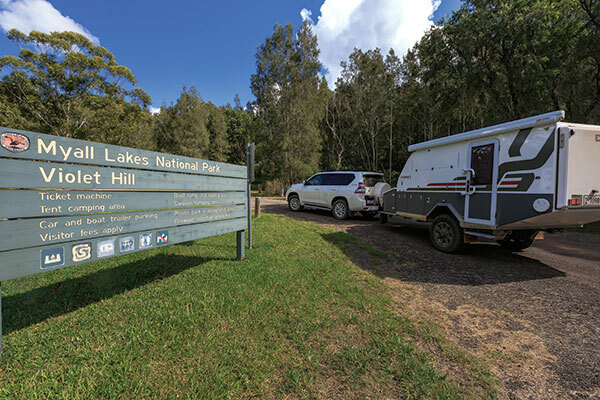 While this campground is comparatively quiet thanks to its location at the end of a 4WD-only track, the turnoff is via the Princes Highway whereas the other great features of the park are accessed from the east via The Lakes Way. 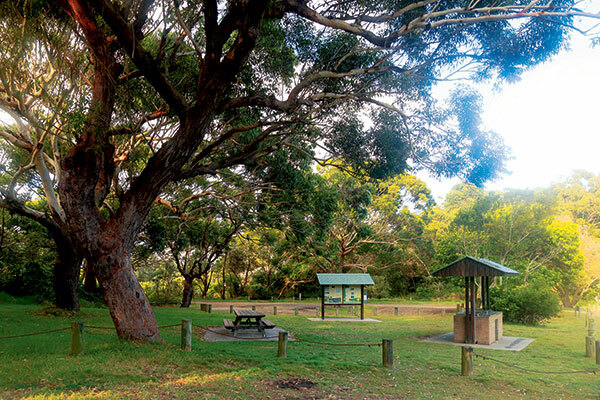 Wallingat NP is full of great walks and bike tracks, and is forested in beautiful subtropical rainforest and towering gum trees. 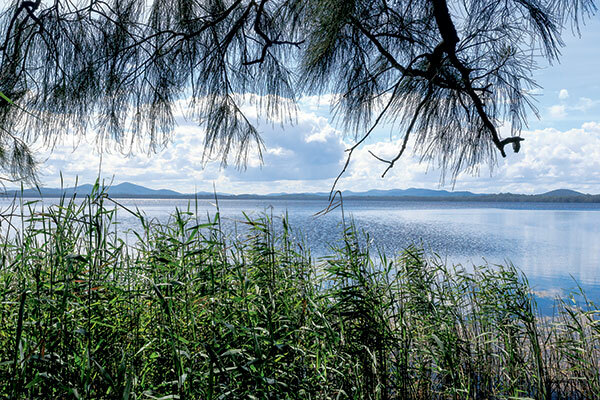 Perched on the north-eastern corner of Myall Lake, Neranie offers both lakeside and bush camping, but we’d definitely recommend the former. Perfect for young families, there’s direct access to the calm waters of the lake for swimming and paddling about on lilos, barbecue facilities, drop toilets and easy walking tracks. Sites are shady with a very pretty outlook, although some would be a little awkward with longer rigs. There’s a boat ramp nearby, too, and Seal Rocks is a short drive away if you fancy a dip in the ocean. 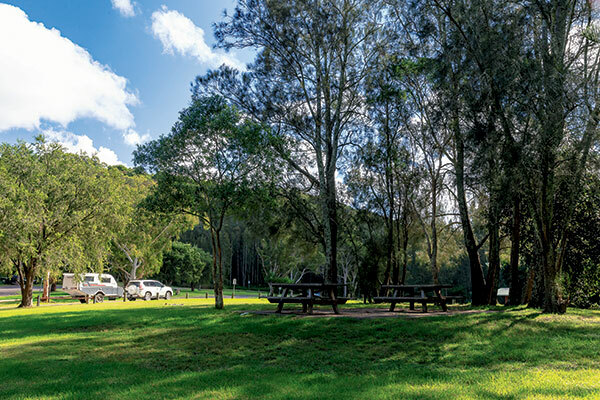 Like a sunny oasis surrounded by dense coastal scrub, Violet Hill is a verdant, sprawling and mostly flat campground in a really beautiful location where Myall Lake meets the protected area of Boolambayte Lake, where fishing is prohibited. Camping area is thickly grassed and unmarked (not a bollard in sight), with plenty of space to manoeuvre larger rigs or settle in as a group. We had it to ourselves when we were there, save a few people who’d launched their boats at the onsite ramp. Tall gums shade the picnic area and a little jetty juts out from the paperbarks at the water’s edge, the perfect place to launch one’s kayak (or oneself) into the crystal-clear water of the lake. DON’T MISS: Watch for goannas at the water’s edge. Surfers, listen up, this one is for you. 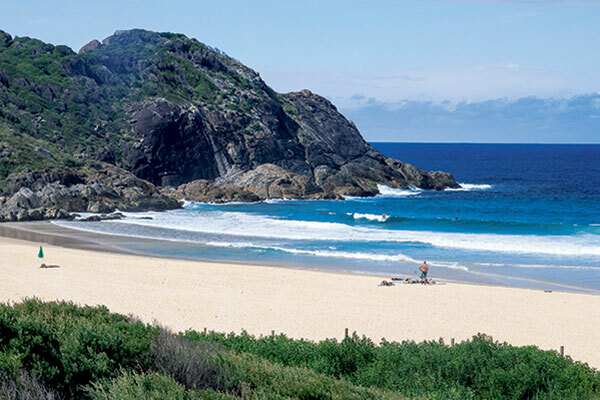 Located a 10-minute drive down a good dirt track from the sleepy settlement of Seal Rocks, Yagon is a grassy campsite nestled among the dunes of Submarine Beach, a sprawling stretch of coast perfect for fishing and surfing. Nearby Lighthouse Beach offers 4WD access, and next door to that is the post-card perfect, sheltered waters of Seal Rocks where a long right hander peels away gently from the point, perfect for surfers of all levels. 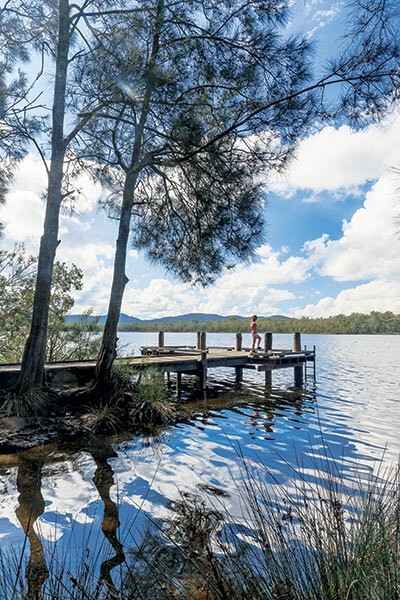 Yet another idyllic lakeside camping spot, Korsmans fronts the pretty Two Mile Lake, accessed via Bombah Point Road from Bulahdelah and Mungo Brush Road from the south. There’s are many sites available, some flat and sandy, others grassy on a slight slope. It’s a pretty, wooded camp with access to the safe waters of the lake via a beach, a jetty and a ramp. Perfect for those looking to explore the region from the water, by kayak or tinnie. 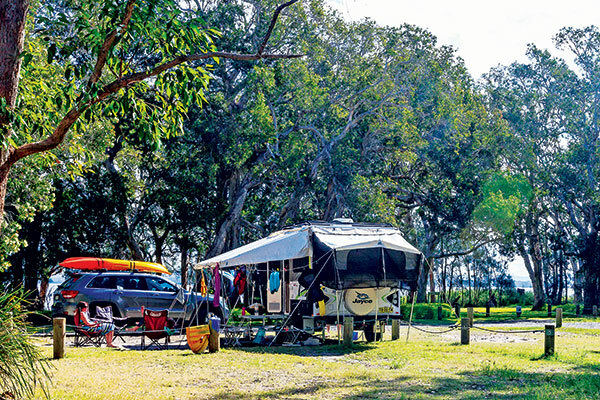 The southernmost campsite in our line-up, Dees Corner is one of a number of campsites fringing the Bombah Broadwater in the southern reaches of the Myall Lakes NP. We’ve chosen it for its large, grassy campsites, some tucked into protected nooks among the dense palms and all with fantastic access to the grassy foreshore of the lake. There are plenty of flat, shady areas here for the kids to play and some beautiful paperbark trees hanging over the water just begging to be climbed. Forster is 165km north of Newcastle and 110km south of Port Macquarie. Driving is permitted on nominated beaches in the Great Lakes Council and Greater Taree City are. Permits cost $50 per annum. Visit www.greatlakes.nsw.gov.au for more. 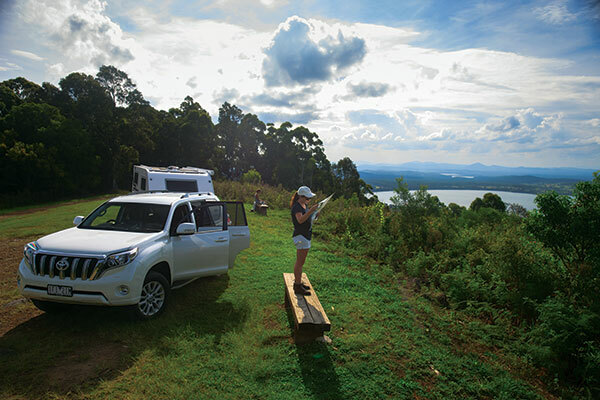 You can cross the lakes at Bombah Point for $6 per vehicle plus $6 per van, trailer or boat trailer via ferry. Visit www.nationalparks.nsw.gov.au for more information on camping in the Myall Lakes, Wallingat and Booti Booti national parks.